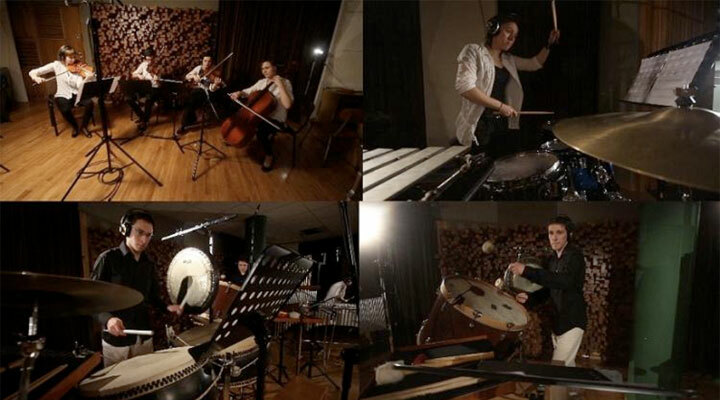 The piece "Ignition" is a unique and unprecedented combination of instruments - string quartet and percussion trio. Composer using all past experience combined with modern techniques using string instruments as a percussion of the most interesting in their classic sound. The rich group of percussion instruments delights a wide palette of colors and rhythms. The sound of the instrumental parts adds a layer electronic heightened narrative, surprising and merge into their sound. The piece of fast paced action, tense moments and energy interspersed with soothing phrases and innovative sounds of the work of the XXI century. Performers of this piece are Airis Quartet, string quartet and percussion trio Amadrums Trio. These are the bands performing in the country and abroad, winning at festivals and competitions, which have their own individual performance style and their common feature is certainly the vigor and strong persuasion stage. Their artistic way met the XIV International Contemporary Chamber Music Competition in Krakow, where each has been awarded (Airis Quartet-Special Prize Polish-Danish Friendship, Amadrums Trio-Grand Prix, Sound New Prize). Since then, prevailed by the common goal to create an innovative design and combine their skills and styles. Invited to cooperate with the extremely creative younger generation composer Lukasz Pieprzyk. Lukasz is a PhD student in the composition class prof. Krzysztof Penderecki at the Academy of Music in Krakow. Twice he won second prize in competitions for composers Patri Patriae. Graduate composition at the Music Academy in Krakow (with honors) in the class of prof. Zbigniew Bujarski and professor of computer music prof. Marek Chołoniewski. His compositions and video-arts have been performed many times in Krakow, Katowice, Lodz, Warsaw and Wroclaw (Musica Polonica 2008) as well as abroad - in the USA, Germany, Italy, Romania, the Czech Republic. In May 2010 he graduated from film music workshops at NYU in New York, where he recorded his music to a portion of the movie "Serenity". In July 2010, the song "Stripes" won the Audience Award at the composition competition Wawel Musica Festiva. In 2010 graduated from the Postgraduate Studies in Film Music and Theatre in Lodz. © 2010-2013 AMADRUMS TRIO. ALL RIGHTS RESERVED.